Trusted by over 10,000 Canadian website owners. Start Your Own Web Hosting Company Today! Create accounts risk-free with our full 30 day money back guarantee. Start reselling web hosting today with all the tools you need. 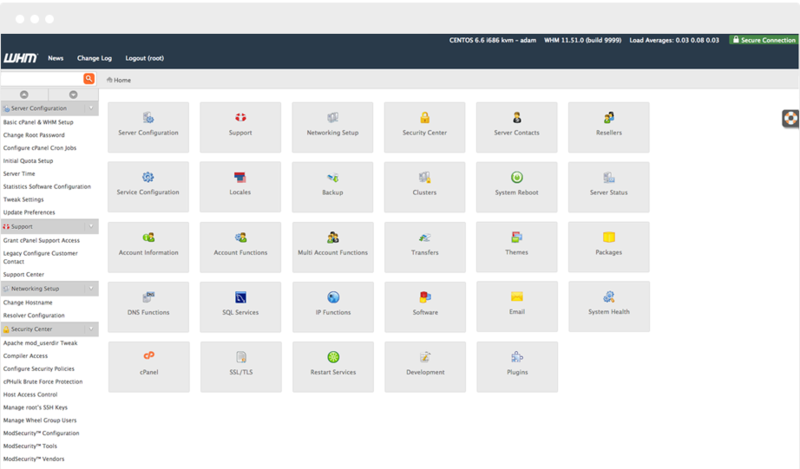 Manage your reseller account with WHM and give your clients their own individual cPanel account. Create cPanel accounts on the fly and take full control using the award winning WHM control panel. Our reseller plans are fully white labeled allowing you to brand cPanel with your own business logo. You'll also be able to setup custom name servers giving you privacy and trust. Our reseller plans include RV Site Builder ($12/mo value), a simple website builder to help your customers create their own professional website with over 700 mobile-ready templates. With our Softaculous 1-click installer your customers can install over 360 open-source scripts including WordPress, Joomla, Drupal, OpenCart and hundreds more! We'll register a new domain or transfer your existing domain free of charge on annual plans or longer. Domain names will renew at the regular rates after the initial year. Support is what separates us from the pack. You'll have direct support to our award-winning team in Toronto helping you every step of the way. If you're switching to us from another provider we'll migrate everything over free of charge. We'll make the transition as seamless as possible to ensure there is no service interruption. All reseller plans come with CSF and LFD firewalls and a real-time malware and virus scanner directly inside cPanel. Plus brute-force detection as an added layer of security. We're sure you'll love us but just in case we'll give you a full refund within 30 days, no questions asked. Managing your Reseller Hosting is simple with WHM. You can use WHM's interfaces to create cPanel accounts, email accounts, create hosting plans and manage your reseller clients. What is Reseller Hosting And How Does It Work? With HostUpon Reseller Hosting you have the ability to start your own Hosting Business reselling our hosting services. You create your own hosting plans and prices for your customers giving you endless profitable opportunities. From within the WHM panel you can create accounts for your clients so each client has their own individual cPanel control panel. If you need help at any time simply contact us 24/7, we're here for you! Yes, you can create plans with unlimited resources such as disk space, bandwidth, email accounts etc. You can even offer 'unlimited' resources and features to your clients. You're simply limited by the resources based on the plan you choose. What does 'White Label' mean? Our reseller plans are designed to 'hide' who you're hosting with so you can brand your business with your own logo. With custom name servers your clients won't know you're hosting with us and this not only brands your business but gives your customers trust. Can I pay monthly or change plans at any time? Yes, you can pay monthly, quarterly, 6 months, 1 year, 2 years or 3 years. You can change your billing cycle at any time and also switch plans on the fly. Simply contact our billing team at any time. Do you provide a free website transfer from my current host? Yes, we'll migrate your website or entire reseller plan from your current provider free of charge. Our goal is to ensure your migration is seamless with no service interruptions. Who provides support to my customers? As a reseller you'll provide support to your customers and we'll provide direct support to you. You can contact us 24/7 via our ticket system, live chat or phone support. We'll help you every step of the way! Where can I purchase domain names for my clients? You can purchase additional domain names directly through us on behalf of your customer and manage them through your HostUpon Client Area. How much can I charge my customers? The earning potential as a reseller is limitless. Our reseller plans give you the freedom to charge whatever you'd like. Our Reseller Hosting also gives you the ability to create and customize your own plans, for even greater flexibility and higher profit margins. "Our web design firm has been using HostUpon for over 3 years now. We've been reselling hosting to our clients with the help of HostUpon and have been thoroughly impressed with the support each time we've needed a hand. Absolutely recommend them if you're looking to launch a web hosting business, couldn't be happier." Copyright © 2006-2019 HostUpon Inc. All Rights Reserved.